Replacement Walbro Carburetor and Parts: If your 2-Cycle small engine has a Walbro Carb that needs an adjustment or a complete rebuild, turn to Jack's! From Needle Valves, Primer Bulbs and Carburetor Kits, to complete replacement Walbro Carburetors, Jack's has the parts you need to get your Walbro Carb cleaned up and running its best. 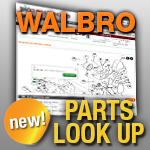 Walbro Model Number Lookup:Examine the side of your Walbro carburetor to locate the model number. The number is usually two letters followed by two or three numbers (i.e. WT451).